Yehuda Gilad is one of the most sought-after clarinet teachers, currently on the faculty of the Colburn School of Music and the USC Thornton School of Music. Passionately advocating the full range of classical and contemporary music, Gilad is regularly giving masterclasses around the world and also counts as one of America’s most dynamic and charismatic conductors. As an incredibly gifted pedagogue, Gilad combines his performance, teaching and conducting experience into a unique approach of “total musicianship” where he focuses on the human side of the clarinet and how to find your own voice and personal level of playing. Yehuda shows us his great pedagogical skills by sharing unique approaches to key areas of clarinet playing. Discover new ways to practice, and release your musical potential by finding your own voice on the clarinet. A must for every clarinet player. Everyone knows that playing scales is important but Gilad has his own methods to share with you. Yehuda Gilad passes on ideas of generations about how to sing your intervals and how to achieve this in practice by using his "trampoline method". Yehuda Gilad has helped hundreds of students shaping and building the fundament of where instrument and body meets: the embouchure. 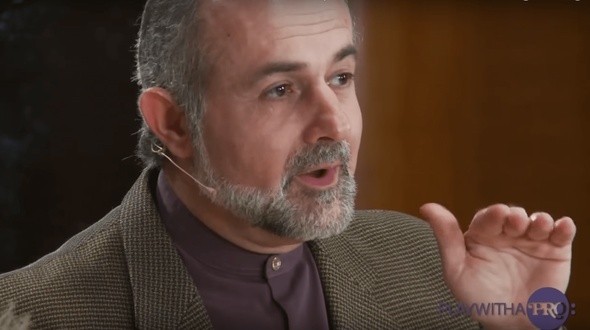 Learn from his unique approach to this fascinating topic. I have watched this video numerous times and must say that Mr. Gilad has great ideas. Even if you play a wind instrument other than the clarinet, you can learn a lot from this video. I've been playing for three years and Gilad's Learning the basics course was not giving me what I needed to move to the next level. I believe any of his videos could be helpful to a very much more advanced musician. Instead, I feel Charles Niedich's approach might be better for a student at any level. I was much happier with that purchase. Great choice to learn from the master. Some concept in this video are useful to any wind player. Very unique approach. Great way to practice and to bring it to a personal level of playing and finding your own voice on the instrument. 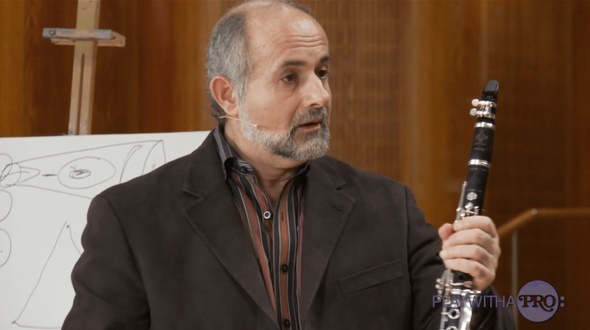 Yehuda Gilad Clarinet Fundamentals provides a different approach on how to improve on the basics of clarinet playing. Although I enjoyed his approach and examples, I kind of like better Lee Morgan explanations of clarinet fundamentals and his detailed explanations. merveilleux! !je progresse tous les jours avec ces cours!! Unlike in the Fundamental Classes by Charles Neidich and Lee Morgan Yehuda Gilad concentrates more on the "human" part of clarinet playing. So he gives advice how to imagine certain things in order to play them better or even to feel more comfortable with them. His ideas start from the brain/mind - the first place music begins on any instrument. Although it is not quite easy to follow Gilads explanations (I am so glad there is a rewinding function) you can only profit from trying out his concepts. Great pedagogy with some fresh approaches to some of the basics of our instrument! It is wonderful to have the possibility of learning directly from a true master. While not as lengthy as the Lee Morgan and Charles Neidich fundamentals, there is still a lot to be learned from by watching these videos. A truly spectacular teacher on display here. This is wonderful teaching a summation of the key areas of clarinetistry. Learn hands-on advice on technique, sound and musical interpretation - exemplified through masterclasses of some of the most important and beautiful works. Nielsen Clarinet Concerto is still today one of the most difficult pieces in the repertoire In this class you´ll discover details and technical tips that will help you overcome problems and improve your playing in this great piece. Yehuda Gilad is a professor of clarinet at the Colburn School of music and the University of Southern California (USC) Thornton School of Music. As well as being a very accomplished clarinetist, he has also been called one of today's most dynamic and charismatic conductors. His former teachers include Mitchell Lurie, Herbert Zipper, and Giora Feidman. In addition, Mr. Gilad participated in numerous masterclasses with Sergiu Celibidache and the late Leonard Bernstein. Yehuda Gilad teaches one of the masterpieces for clarinet and piano- Weber´s Grand duo Concertante. Yehuda teaches principles of breathing and blowing, the embouchure, projection and focusing the sound, engaging the soft palate, overtones and much more in this masterclass. Yehuda Gilad is a professor of clarinet at the Colburn School of music and the University of Southern California (USC) Thornton School of Music. As well as being a very accomplished clarinetist, he has also been called one of today's most dynamic and charismatic conductors. His former teachers include Mitchell Lurie, Herbert Zipper, and Giora Feidman. In addition, Mr. Gilad participated in numerous masterclasses with Sergiu Celibidache and the late Leonard Bernstein. Debussy Rhapsodie has it all, and it´s tricky like crazy. Break it down with Gilad who shares insights and knows how to practice this piece in an efficient and useful way. Yehuda Gilad has been one of the most sought after clarinet teachers for many years and he travels all over the world to teach students at the worlds leading music conservatories and schools. An incredibly gifted pedagogue and teacher and one of his generations finest clarinet players himself, there is not much he doesn´t know about the challenges most players face from time to time. He is THE clarinet doctor and problem solver. See for yourself and learn serious stuff from a true master of clarinet teaching. Yehuda Gilad teaches at Colburn University in Los Angeles. One of the standard pieces for clarinet is Weber´s 1st Clarinet Concerto. So much fun, so much beauty and so many challenges. Gilad guides you through the challenges and difficulties and shares lots of tricks that will help you to make music out of this great piece in an easier and more joyful way. Yehuda Gilad has been one of the most saught after clarinet teachers for many years and he travels all over the world to teach students at the worlds leading music conservatories and schools. An incredibly gifted pedagogue and teacher and one of his generations finest clarinet players himself, there is not much he doesn´t know about the challenges most players face from time to time. He is THE clarinet doctor and problem solver. See for yourself and learn serious stuff from a true master of clarinet teaching. We guarantee inspiration and a new level of understanding how to improve your playing. Yehuda Gilad teaches at Colburn University in Los Angeles. 1st clarinet sonata in f-minor is one of the late masterpieces by Brahms.This piece has it all – drama, long lines, beauty, cheerfulness, technical difficulties...you name it, and Gilad is the big master who knows what to do when you stand face to face with this giant. Yehuda Gilad has been one of the most saught after clarinet teachers for many years and he travels all over the world to teach students at the worlds leading music conservatories and schools. An incredibly gifted pedagogue and teacher and one of his generations finest clarinet players himself, there is not much he doesn´t know about the challenges most players face from time to time. He is THE clarinet doctor and problem solver. See for yourself and learn from a true master of clarinet teaching. We guarantee inspiration and a new level of understanding how to improve your playing. Yehuda Gilad teaches at Colburn University in Los Angeles. Denisov Clarinet Sonata is one of the modern clarinet repertoire´s masterpieces and is on most competitions for many reasons. First of all it´s a great piece of music- but it´s use of quarter tones, odd rhythms and extreme jumps makes it a serious challenge even for the experienced player. Watch- learn and improve from one of todays absolute most amazing clarinet teachers- Yehuda Gilad. Yehuda Gilad has been one of the most sught after clarinet teachers for many years and he travels all over the world to teach students at the worlds leading music conservatories and schools. An incredibly gifted pedagogue and teacher and one of his generations finest clarinet players himself, there is not much he doesn´t know about the challenges most players face from time to time. He is THE clarinet doctor and problem solver. See for yourself and learn serious stuff from a true master of clarinet teaching. We guarantee inspiration and a new level of understanding how to improve your playing. Yehuda Gilad teaches at Colburn University in Los Angeles. Hear the perspective of a true master on important passages of the most common orchestra pieces and get advice how to overcome the challenges. Yehuda Gilad has been one of the most sught after clarinet teachers for many years and he travels all over the world to teach students at the worlds leading music conservatories and schools. An incredibly gifted pedagogue and teacher and one of his generations finest clarinet players himself, there is not much he doesn´t know about the challenges most players face from time to time. He is THE clarinet doctor and problem solver. See for yourself and learn serious stuff from a true master of clarinet teaching. We guarantee inspiration and a new level of understanding how to improve your playing. Yehuda Gilad teaches at Colburn University in Los Angeles. A talk between students and Yehuda Gilad about how to organize your time as a clarinet student, how to prepare for auditions, about Yehuda´s student years and much much more. Yehuda Gilad is a professor of clarinet at the Colburn School of music and the University of Southern California (USC) Thornton School of Music. As well as being a very accomplished clarinetist, he has also been called one of today's most dynamic and charismatic conductors. His former teachers include Mitchell Lurie, Herbert Zipper, and Giora Feidman. In addition, Yehuda Gilad participated in numerous masterclasses with Sergiu Celibidache and the late Leonard Bernstein. Get all Play with a Pro videos for clarinet for a strongly reduced price. Get all Neidich, Gilad, Morgan, Campbell and Simonsen clarinet videos and start learning from the world's greatest teachers today.